Aniseed is an annual herb that can grow up to a metre tall in ideal conditions. Aniseed is native to the Eastern Mediterranean as well as Southwest Asia. Aniseed plants were first cultivated in parts of the Middle East and Egypt, where it was used both as a culinary and embalming spice. Anise seeds have a strong, medicinal flavour. The compounds responsible for this flavour is found in many other plant species including licorice root and fennel and anise seeds have a similar flavour to these. Anise seeds can be used whole or ground to make a licorice flavoured tea, or used ground to flavour cakes, biscuits and sweets. The young leaves of Aniseed plants are edible raw or cooked and have a refreshing sweet licorice flavour. If cooking with Aniseed leaves add them only at the last minute or their flavour will be lost. Anise seeds are used in traditional herbal medicine to reduce flatulence and calm diarrhea. Aniseed will grow best in a location that receives plenty of sunlight, but it will tolerate light shade for part of the day. Requires a free draining soil, grow Aniseed in raised beds if your soil is too compacted or heavy with clay. Aniseed grows well in a rich sandy loam soil, dig lots of organic matter including well-rotted manures, compost or worm castings through your garden beds to help improve your soil structure, encourage worms and beneficial soil microorganisms, and provide nutrients for your plants. Fertilise Aniseed plants every few weeks with a complete organic liquid fertiliser, worm juice or compost tea for best growth. Mulch around your Aniseed plants with sugar cane mulch to suppress weeds, retain moisture and keep their root systems cool. Aniseed grows best in soil with a slightly acidic to neutral pH between 6.2 and 7.3. Aniseed grows particularly well around Coriander plants, and Coriander plants also seem to grow better when planted near Aniseed. Aniseed grown near basil is said to increase the essential oil content of the leaves resulting in a more flavoursome basil. The scent of Aniseed is also thought to repel aphids, planting it near susceptible plants may be of benefit. Aniseed flowers attract and provide a nectar source for the adult stage of various caterpillar-parasitic wasps. In cold and mountainous regions of Australia sow Aniseed from October to December. In temperate regions of Australia sow Aniseed from September to January. In subtropical regions of Australia sow Aniseed from September to February. In tropical regions of Australia plant Aniseed during the early dry season from March to May. Sow Anise seeds 6mm deep spacing plantings about 25cm apart. Anise seedlings won't grow well if their long tap root is damaged during transplanting, because of this it's best to sow Anise seeds directly where they are to grow. Aniseed can be slow to germinate, however most seedlings will emerge within 10 to 21 days after sowing the seeds. 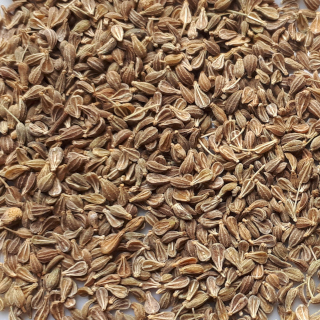 Aniseed requires a long growing season to produce seeds ready for harvest, 17 to 18 weeks on average.